woodland areas or in your shade garden. but they spread indefinately by rhizomes just below the soil surface. 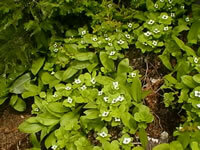 which consist of a cluster of tiny greenish flowers surrounded by four creamy white bracts. for many species of wild birds and other wildlife. In the fall, the shiny, deeply veined foliage turns to a beautiful burgundy-red. 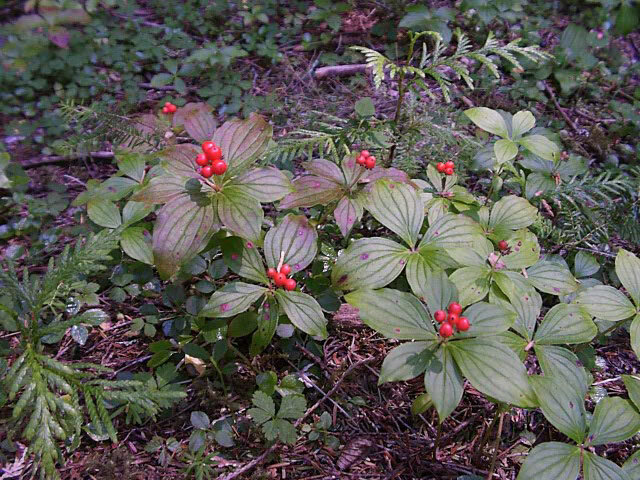 Unfortunately, Bunchberry plants are pretty fussy about where they will grow, but they are well worth the effort it takes to help them thrive. They will tolerate morning sun, but should be grown in partial to full shade for the best results. Creeping Dogwoods demand a loose, moisture retaining, humus rich soil, so add lots of compost and peat moss to the planting hole. They will not tolerate alkaline soil at all, requiring a soil pH of 6.8 or lower. These are very heat sensitive plants that will wither and die if soil temperatures exceed 65°, or if the soil ever dries out completely. A heavy mulching with peat moss or pine needles will help the soil retain moisture and keep it cooler. Water regularly and thoroughly during dry periods. Bunchberries can be propagated by cuttings taken just below the soil surface in mid summer. Strike in a moist, 50/50 mix of sand and peat moss. Bunchberry seeds can be planted ¾" deep in the garden in the fall. The seeds require a period of stratification for germination, so if you are starting them indoors, store them in moistened peat moss in your refrigerator for three month prior to sowing into flats or pots. Unfortunately, germination can take two or three years.